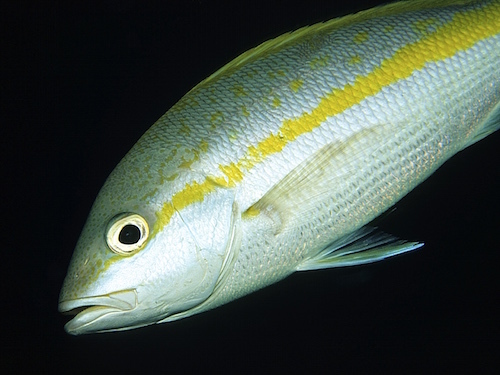 If you’re new to fishing, learning how to catch yellowtail snapper is one of the first things you’ll want to learn since the fish is widespread and easy to catch. In fact, the yellowtail has become common fare among guides and charter captains because if no other fish was available, they’d go for the yellowtail. It’s not only easy for beginners to catch, but they’re delicious too. What Tackle Should I Use? Yellowtail fish can grow up to 5 or 6 pounds, but it’s rare you’ll find a five pounder these days. For regular yellowtail you’ll want a 15 lb. spinning tackle equipped with a fluorocarbon leader and monofilament line. As for the terminal tackle it’s best to use a simple one with a circle hook on the tip of the fluorocarbon leader. On some occasions you might also want to utilize a small sinker, but more often than not a hook is all that’s necessary for free line fishing. Yellowtail are 100% reef fish, and they’re a schooling fish so if you find one chances are you’re going to find the rest, which is why fishing for yellowtail is easier compared to others. Most of these fish can be found around bottom structures that point up from the bottom, such as a hump or a reef. You can find many of these natural and reef formation along the Atlantic reef line’s outer edge from the Key West to as far as North Carolina, with many of these formations elevating from the floor to as high as 40 feet. With the aid of a fish finder or GPS you’ll have no trouble finding these. You can mark these locations with a GPS, but when you’re searching for a new location, keep two things in mind. First, look for a hump, drop off or a ledge, and once you locate one of these, use a fish finder to check if there are fish there, which should appear as a large mass on the device. They’re usually found near the bottom or just off the bottom of the water column. When you have located some schools you can use the fish finder to determine if they’re yellowtail or not. If you’re yellowtail snapper fishing from a boat you have to anchor at the right location. Anchoring at the hard bottom is ideal, but don’t do it over a reef. Drifting is possible but if you really want to get the yellowtail, anchoring is necessary. Provided you have found an area where there’s a school of fish and you’re allowed to anchor, you have to gauge the current and wind and anchor up current. This is important because your boat needs to be positioned up current from the structure as you’re going to free line the bait in the current to the yellowtail. With drifting this will be much harder. You should also bring at least a bag of chum and some frozen chum as well. Generally speaking, any chum that melts fish parts can be classified as frozen chum, and for good measure you should have frozen glass minnows thawing as well. Let the chum drift off your boat and in the water. if the current is too powerful and the chum drifts, anchor your boat further up. Allow the chum to flow for 10 minutes and then take out your hook, bait and put it in the water. Let this go naturally and allow it to drift. With a circle hook, you only have to reel in when a yellowtail has taken a bite. Even if you have the best bait for yellowtail snapper you will need to make adjustments as yellowtail are intelligent fish. For instance, you should avoid using heavy lines because that can spook the fish, especially the bigger ones. To prevent this from happening you should use a fluorocarbon leader and a light monofilament. A small circle hook is also recommended since it’s easier to conceal the bait, plus it allows for a faster bite from the fish. If you think fish is down there but they’re not biting, your bait might be too deep or shallow. In this case you can use a split shot to put your bait down deeper. You’ll also find the glass minnows useful here: if the yellowtail aren’t biting, take some of the minnows and scatter them at the back of your boat and that will draw them in. That being said, you have to use minnows only as a last resort because if the yellowtail gets used to them, they’re going to ignore your other baits. Aside from minnows, you can also use live shrimp to get the yellowtail to bite. If you’d done any type of fishing before you’ve no doubt realized that live shrimp is popular bait, and it’s also effective here. Some anglers prefer live shrimp while others opt for dead bait. The way to approach this is to use both: first you start with live shrimp to get the attention of the yellowtail, and once they start feeding, throw out the dead shrimp. You can use the same approach with other types of chum and bait like cut mullet and frozen squid. It really comes down to what type of bait is available to you and how prevalent the bite is. As was pointed out above, you only need to use these tactics if the yellowtail are not responding to your usual approach. Don’t get them used to the “special food” because that’s all they’ll be looking for. There are many types of yellowtail fishing lures and baits you can use, which only underscores the fact that they’re easier to catch compared to other fish. Provided your chum draws them in and you have concealed your bait, landing some won’t be a problem. If the yellowtail doesn’t bite, make adjustments to your boat’s position and the speed which your bait drops.